The practice of heating asphalt for repair purposes was first used around 1923, but at the time it was not technically infrared. Infrared heating technology of asphalt began in 1964 with Poweray Infrared Corp. Wes Van Velsor, a former owner of Poweray, founded Ray-Tech Infrared Corp. in 1989. He used his years of experience with Poweray to design several new machine models to fit specific needs on the worksite. Wes then started and ran a repair company, Environmental Enterprises, that utilized various Ray-Tech machines to perform repair jobs all over New England. 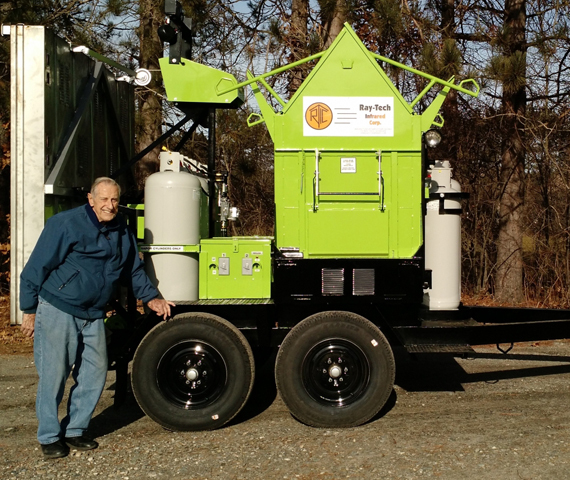 Over the years Wes applied what he learned from the operation of these machines in order to improve upon some of the equipment designs to make them more user-friendly and efficient. He also designed and manufactured brand new models of equipment based on the original technology to grow the product line. Keep the equipment simple and easy to operate while at the same time allowing the user to carry out permanent, high quality repairs. Pavement Heater: The asphalt pavement will attain a 220°F minimum temperature at 2″ depth, with 400°F maximum temperature at the surface, within 6 to 8 minutes of heating time, at a 50°F ambient day and standard asphalt mix design. Asphalt Reclaimer: The asphalt will attain a 270°F minimum average mix temperature after twelve (12) hours of heating time, at a 50°F ambient temperature day, using broken asphalt of standard mix design. Equipment you are presently using, we want to talk to you today!